Cloggs cashback can be earned simply by clicking through to the merchant and shopping as normal. Cloggs Cashback is available through TopCashback on genuine, tracked transactions completed immediately and wholly online. Take advantage of our fantastic Cloggs cashback deals to save yourself some money when getting yourself some new shoes, boots, sandals or just about any other type of footwear you can imagine. Serving millions of customers all over the world, they handpick each and every brand they work with and all of the styles they stock. They try to ensure that you will always be able to find the latest and best in fashion footwear, while Cloggs also stock brands which have stood the test of time. They have more than 40 years of experience in the footwear industry and their aim is to help customers find the perfect pair of shoes every time they visit the website or one of their stores. They offer free standard delivery on orders over £60, as well as free returns and a student discount, while if you sign up to their newsletter, you will receive 15% off your first order. No matter what type of footwear you are looking for, the Cloggs collection is packed full of leading brands. 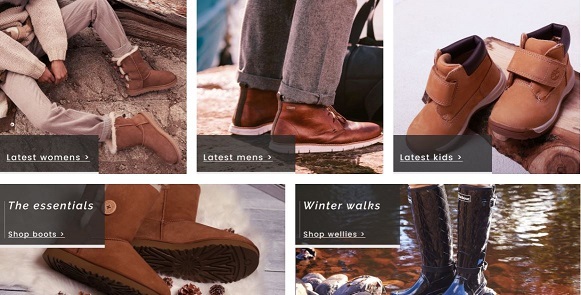 You can browse new arrivals if you want this season's summer or winter shoes, while their men's, women's and children's ranges offer everything from heels and trainers to wellies and slippers. You can shop by brand if you love Clarks, Converse, FitFlop, Hunter, Timberland or UGG footwear, or by shoe size. See what's hot in women's footwear, while no matter what you are looking for, you will be able to view the latest offerings by the likes of Ted Baker, Joules, Skechers and Barbour. If you need a new pair of trainers, you are also able to narrow your search down to leather, metallic or canvas styles, while their clearance section will give you the chance to grab a bargain across all collections. Before you buy, don't forget to join TopCashback via the form further down this page to get a little back when you shop online through us. While Cloggs have been online since 1998, they have more than 40 years' experience of selling footwear. They began in 1979 as a single boutique in Birmingham's famous home of alternative shopping, the Oasis Market. Cloggs was founded by Russell Thomas and it remains a family business to this day, with his son Chris in the role of managing director. However, they are now owned by JD Sports Group. They became a dedicated footwear only retailer in 2008, although they are now beginning to diversify with a growing range of accessories. In consecutive years from 2010, they won Best New Store and Specialist Etailer of the Year (twice) in the Drapers Footwear Awards. As well as being acquired by JD Sports, 2013 also saw Cloggs relaunch on the high street with the opening of a store in Shrewsbury. The same year also saw their website go responsive, making online shopping even easier for customers. In 2014, new stores were opened in Newcastle and York, while the following year saw them win the Best Multichannel Retailer (Under £10 Million Turnover) at the Drapers Digital Awards. If you love getting your hands on the latest footwear trends, Cloggs is the place to shop as they offer many items which are available to pre-order. This allows you to be among the first in line for shoes which are not yet available. You will be able to spot pre-order items as they will be highlighted by a disptach on or before message which will be followed by an expected in stock date showing next to the size in the drop down menu. If you pre-order an item, payment will only be taken when it is dispatched, while you will be notified of the date they expect to take delivery of the item (subject to the manufacturer delivering on time). Until this time, your order will show as Backorder. Should an item not be available for pre-order, Cloggs advise you to keep checking the website due to the fact that as soon as an item is available to buy online again, it will automatically be showing the sizes available. Put your best foot forward and get yourself a great cashback deal on men's, women's and children's footwear with these Cloggs offers. Cloggs stock the widest ranges of the best known high street brands and deliver them to your door. Shop for women's boots, heels and sandals, men's trainers, brogues and boat shoes, as well as great children's shoes, bags and accessories. Buy top brands like Converse, Dr Martens, Clarks, Timberland and more.